Active transportation planning in the Greater San Diego area has been uneven the past several years. Advocates have sued to stop the long-term regional plan passed by the San Diego Area Governments (SANDAG) because it focuses too much on building carpool and variable toll lanes and not enough on active transportation to meet the state’s greenhouse gas goals. But yesterday, SANDAG also announced a plan to build $200 million of bicycle infrastructure over the next decade at the California Bike Summit, being held in San Diego this week. Via the San Diego-Union Tribune. In an interview at the California Bike Summit, California Bicycle Coalition Board member Stephan Vance said other ambitious projects, including a route along to the San Diego River to near Qualcomm Stadium, will be designed by the end of next year. “Let’s see how much of those we can get finished,” he said. Vance, who is also a regional planner with the San Diego Association of Governments, was speaking as a California Bike Coalition Board member. These routes are expected to make riding safer so that people who are reluctant to ride will feel more confident, said Andy Hanshaw, the executive director of the Bike Coalition of San Diego County. Vance seems both enthusiastic about the prospect of so much investment in bicycle infrastructure and wary about the possibility that the region might not follow-through on its promises to invest in the long-term. While funding is a concern, towards the bottom of the article, Assemblymember Toni Atkins rules out the possibility of raising these funds through a direct tax on bicyclists. 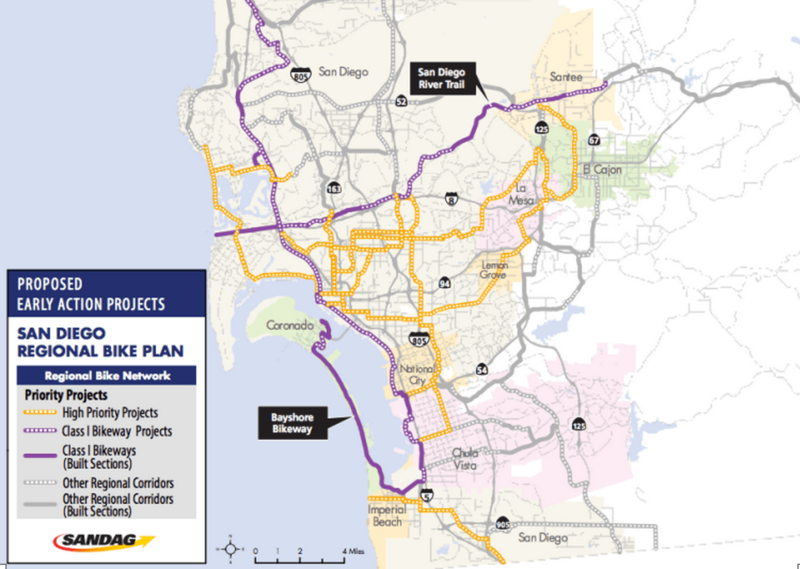 For more on the San Diego Regional Bike Plan, visit the SANDAG website here. There’s also fact sheets in pdf format for some of the major projects listed in the Union-Tribune article including the Contra Costa Trail Rail Trail, the Uptown bikeway network and the Mid-City network. Unfortunately San Diego has a long history of promising this sort of thing and then backing down the first time anyone objects. The uptown bikeway network’s backbone (University ave.) was broken even after I and over 100 other people spoke in its favor because the Hillcrest Business Association spent over 20 grand on a lobbyist to convince SANDAG to kill it. University remains both a heavily biked AND incredibly dangerous street – I know of no greater argument in favor of improved bike infrastructure, and still SANDAG opposes it.